The Officer Lucky Irish Santa policeman features shamrocks and a Teddy bear. 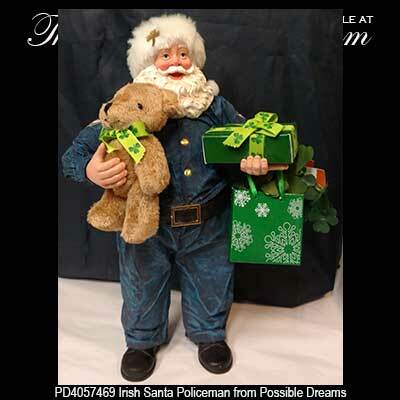 The Officer Lucky Irish Santa policeman figurine is from Possible Dreams and he features a green stocking cap with a gold shamrock and a plush Irish Teddy bear. 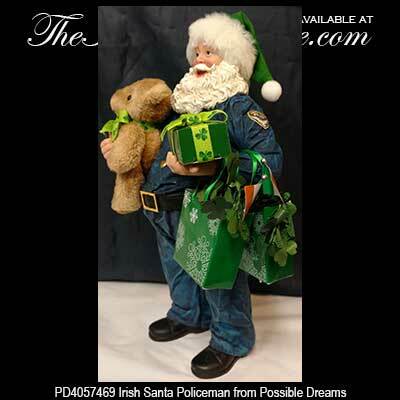 The Irish police officer Santa is carrying shamrock decorated gifts and has shamrocks galore flowing from his bags. 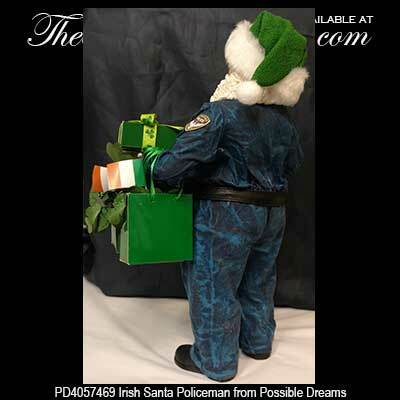 The Irish Santa decoration is made of porcelain and clothique©, and Officer Lucky, who is a member of the North Pole Police Department, measures 6 1/2" wide x 4" deep x 11” tall. The Irish Santa cop is gift boxed with a shamrock history card that is complements of The Irish Gift House.